Transforming the bottom line with analytics, big data and a new way of thinking. The age-old adage of man vs. machine applies more befittingly to the manufacturing sector than perhaps any other industry. Implementing new technologies requires investment and risk, and even if that implementation is successful, the conversation then shifts to whether the employee—who was responsible for the task now accomplished by the technology—may no longer be needed. “If we harness technology and act on the data it provides, it will pay for itself.” Lockheed Martin’s Rick Boggs is bullish on the potential of wearables and AR to improve manufacturing profitability. The key to finding a balance, according to Rick Boggs, retired senior fellow at Lockheed Martin, is not to think in terms of replacing employees with new technologies, but rather to use those technologies to empower the individual to do their jobs more effectively. In his presentation, “Empowering Humans at the edge,” at Smart Industry 2017, Boggs explored the opportunities afforded by new technologies, as well as the challenges in convincing others to think differently. In effort to save time and money—as well as reduce human error—Boggs and his team decided to run an experiment during one of these inspections in hopes of conducting them more efficiently. Following the success of this experiment, Boggs decided to apply this kind of approach to other projects as well. The assumption that every employee can be replaced by a robot is a false one, Boggs stressed, noting that a robot can’t take contextual information and use it; it can only use rule-based information. What the industry should think about is how people and technology can work together symbiotically to fill in the gaps left by the other. The biggest challenge as an innovator is not the technology itself, but rather convincing people that process change is good, according to Boggs. According to Boggs, one of the most exciting and potentially impactful technologies are wearables and augmented reality. Though for AR to reach that potential, a case must be made for investing in them. Interested in augmented reality? So are we. 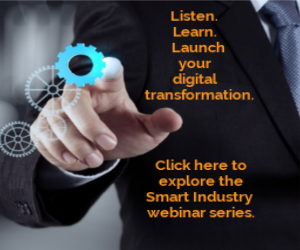 Dig deeper at the 2018 Smart Industry Conference. Learn more here.